For the last three years I have wanted to make over my classroom library, but something always gets in my way. I still have eight days of school left, but I have decided to go ahead and start on my make over efforts. In order to start the make over I have created some really cute labels (at least I think so) for my baskets. I have one set created and will be sharing more of the sets as I create them. 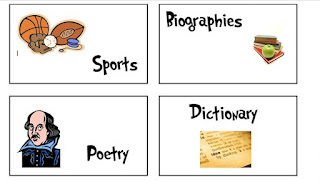 Click on the picture below to get the labels for the following genres: sports, biographies, poetry, dictionary, realistic fiction, science fiction, humor, and adventure. I hope they are helpful and you enjoy! cute labels!! I just found your blog and I am now following! I would love it if you would visit mine :)can't wait to hear all about your great ideas!